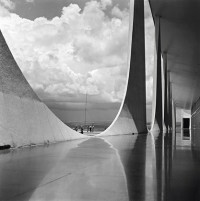 Oscar Niemeyer was born in Brazil in 1907. He studied at the Academy of Fine Arts in Rio de Janeiro from 1929-1934, and after graduation he began working with the architect and urban planner Lúcio Costa. 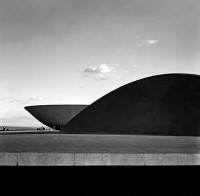 The pair designed the Brazilian Pavilion for New York’s 1939 World Fair. 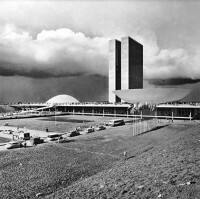 In 1956, Niemeyer was appointed the chief architect of Brazil’s new capital city, Brasília, by President Juscelino Kubitschek, who he had met in 1945 while working on the Ministry of Education and Health building. 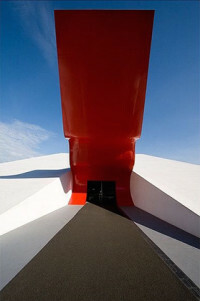 Niemeyer’s architecture is very much influenced by Le Corbusier and can be conceived as works of lyrical sculpture. Niemeyer received numerous awards throughout his life including the Pritzker Prize for Architecture in 1988, a Golden Lion at the Venice Architecture Biennale in 1996, and a Royal Gold Medal for architecture from the Royal Institute of British Architects in 1998. 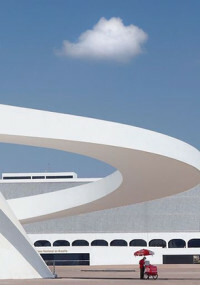 By the time of his death on December 5, 2012 at the age of 104, Niemeyer had created more than 500 buildings across the world.